Not your average hootenanny! 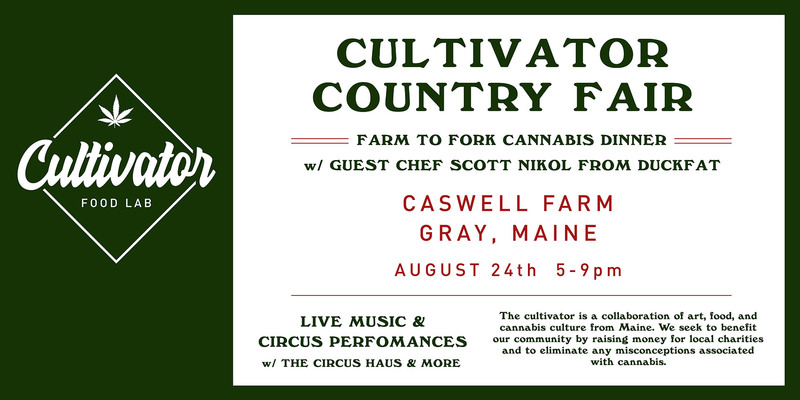 Cultivator Country Fair is a collaboration of art, food and cannabis culture. Be part of history and share in an unforgettable evening that will be sure to peak your palate and your senses. Enjoy an evening of infused courses with ingredients directly from Caswell Farm prepared by regional chefs, such as Josh Potocki & Roux Sutherland of Bread + Butter Catering and Guest Chef Scott Nikol of Duckfat. Sample a variety of flower, concentrates and infusions at your leisure while roving the farm, taking in live entertainment throughout. Proceeds of this event will benefit Maine Center for Grieving Children. Edible Tastings by High Peak Cannabis Co.
and performance art by The Circus Haus. Access to local vendors, artisans and wellness organizations. Will there be unmedicated food options? Will the infusions be THC or CBD? There will be a variety of THC and CBD infusions, which will be labelled appropriately. Will the event be handicap accessible? Cultivator Country Fair is located outdoors on a farm with gravel roads and grass plots. The barn has ramp access. No pets please. Only service animals allowed. Yes. Minimum age 21+ and valid photo ID required. There is parking available. We suggest carpooling and, as always, please don't imbide and drive. Feel free to contact Dave Stephenson at cultivatorcountryfair@gmail.com with questions or concerns. Full refund if requested 24 Hours before the start of the event. No. Your email confirmation and your valid ID are all that you need. This event accepts refunds until 1 day(s) before the event.